A medical manager is one of the many professionals who play major roles and responsibilities in the medical industry. The health care and medical industry is such a complex industry so it requires efficient and effective management in order to smoothly run things. If you are a medical manager, then your responsibilities will usually include overseeing the human resources, operations, financial aspects, records and any other functions related to running a health care or medical organization. This medical manager also plays a major role in the maintenance of profitable operations while also delivering high quality care. This medical professional is also responsible in establishing the most effective medical policies, conducting medical staff meetings, evaluating, hiring, terminating and managing health care employees, preparing payroll, managing compliance issues, preparing reports and budgets, managing accounting functions and coordinating activities with other managers in the medical and health care industry. A medical manager also works in overseeing the process of registering, examining, treating and checking out of patients, developing guidelines designed to prioritize work activities, evaluate effectiveness and modify activities when necessary as a means of ensuring that appropriate levels of staffing are maintained, ensuring all patients are efficiently greeted and directed through the whole registration process and making sure that all accounts and balances are collected from patients before they leave the medical office. All these roles and responsibilities can be expected to help a health care or medical institution thrive despite the competitiveness in this industry. The medical manager certification program which you can now easily access at Brainmeasures is now one of the most ideal online certification courses for you if your aim is to become one of the most effective medical managers at present. With the help of this medical manager course, you will know exactly all the roles and responsibilities that you need to play when you already become a certified medical manager. With the kind of medical manager training provided by Brainmeasures, you will no longer find it hard to supply yourself with the widest level of knowledge about the field including the major roles, duties and responsibilities that you need to play, the scope of your work, the specific techniques that you can use in ensuring that all the affairs of the medical or health care institution that you are a part of are well-managed and the many things that you can do to become really successful and effective as a medical manager. Receiving a medical manager certificate after passing the related online test is definitely beneficial because of its ability to let you access numerous jobs in the industry. How to start your career as a medical manager? How to get the best out of different types of individuals and professionals in the medical industry? How to effectively manage conflicts? 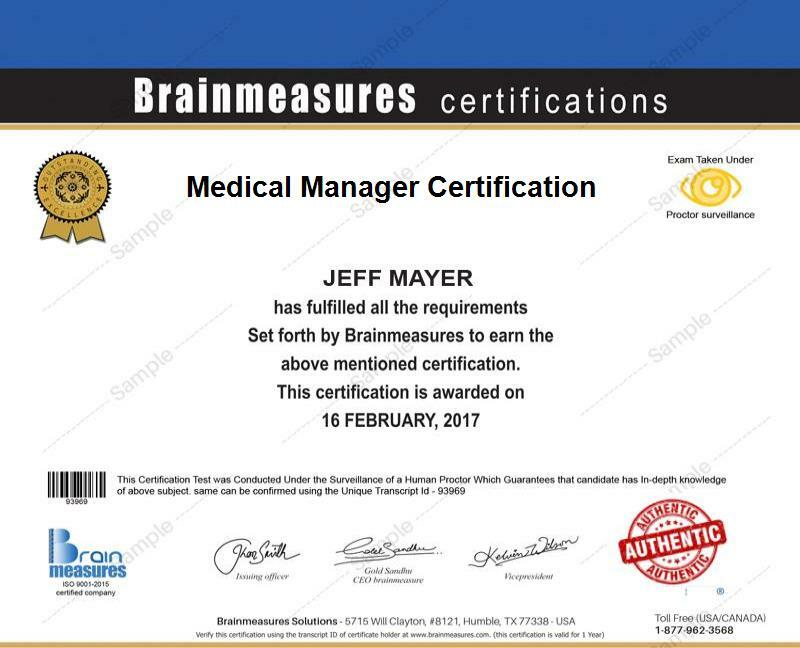 Anyone who wishes to enhance the level of their understanding about medical management can take part in the medical manager certification program which is now available at Brainmeasures. It caters to the needs of all doctors, nurses, health care providers and any other individuals and professionals in the medical industry who wish to gather more information about how the whole medical management process is implemented. Enjoying a higher level of income is also possible if you are already a medical manager certification holder. With the presence of your medical manager certification, you will no longer have a hard time proving to the public that your skills and knowledge in this area are highly competitive so working as a certified medical manager will no longer become impossible. This specific profession lets you enjoy an average annual salary of $74,000.